If you want to know which bits of tech are going to dominate our lives in the near future, look at where the money's going. A case in point: the extra US$0.9 billion (roughly £580,000 or AUS$1.26 million) that Sky has just invested in virtual reality firm Jaunt. Jaunt provides all kinds of kit - from cameras to applications - for budding virtual reality filmmakers. Most recently Jaunt announced its new Neo camera, an expensive, professional-level VR camera that makes Google Jump look like a kid's toy. 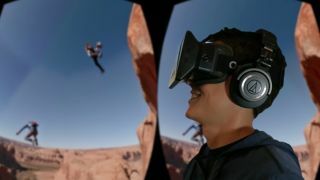 This is just the latest in a series of investments Sky has made in Jaunt since 2013, so the broadcasting company obviously likes what it's seeing - and it could one day pave the way for virtual reality experiences in your living room on Sky Sports or Sky Movies. Jaunt equipment has already been tested on original Sky shows including Fortitude and Penny Dreadful, the company says. It will no doubt be hoping the VR age ends up lasting longer than the 3D TV revolution did. "The market is developing lightning fast so it is brilliant for us to be hand in glove with the team right at the cutting edge," said Sky's Stuart Murphy in a press statement. "It's been amazing working with them over the last two years as we begin to see the technology take off. We are developing some exciting plans for how we can create some amazing viewing experiences for Sky customers." VR is set for a big 2016 with the Oculus Rift and HTC Vive both scheduled to finally go on sale to consumers. After video games, movies and TV shows are expected to be the areas where virtual reality makes the biggest impact.